TAGAJO, Japan (AP) -- Close to the epicenter of Japan's devastating earthquake and tsunami, workers at a warehouse hauled out cans of coffee and soda this week to offer to passers-by for free. "Help yourself! Take what you need!" they yelled as they put box after box on the sidewalk. Their boss Kazuyoshi Chiba said the phone lines are down, so he can't reach company headquarters, but "I think this is the right thing to do." With the same mixture of resilience and resignation that has lifted Japan out of previous disasters, many survivors of last Friday's calamity are calmly pitching in to help themselves and others, taking life one day at a time. Four days on, there is little of the public anger and frustration that so often bursts forth in other countries. The one exception may be near the troubled Fukushima nuclear plant, where fears of radiation leaks are spooking residents and fraying tempers. Elsewhere, survivors search for missing loved ones, clean up their streets and wait patiently for gas -- with regret, for sure, but hardly a complaint. Osamu Hayasaka was among those snapping up the free drinks handed out in Tagajo. "There are a lot of older people near where I live, so I'll give them some of this," the 61-year-old man said, strapping two boxes onto his red bicycle with a bungee cord. His extended family of six has no power, intermittent water and little food. But, he said, he isn't angry at the government; he understands that officials have other priorities. Japan is a nation of 127 million people with a long history of disasters, both manmade and natural, from a 1923 earthquake that killed 142,800 in the Tokyo region to the country's doomed entry into World War II, which ended with the atomic bombings of Hiroshima and Nagasaki. Through these and more recent traumas, including a 1995 earthquake that killed 6,400 in Kobe, the Japanese have endured and rebuilt their country with a usually quiet and uncomplaining resolve. Now, the country's spirit is once again being tested by what its prime minister has called its most severe crisis since the end of the war. The magnitude-9.0 earthquake and ensuing tsunami killed untold thousands on Japan's northeastern coast and left many more without shelter and electricity and scrambling to find water, fuel and food. Even as rescuers begin to reach them, officials are desperately trying to prevent serious radiation leaks from the Fukushima nuclear reactors, where the disaster knocked out cooling systems. Amid the chaos, foreign journalists have remarked on the polite demeanor, the lack of anger, the little if any looting or profiteering that seems to characterize disasters elsewhere. An American academic, Robert Dujarric, was stuck in a halted bullet train overnight after the earthquake. Passengers remained calm and didn't pester railroad employees with questions such as when the train would move again, said Dujarric, the director of the Institute of Contemporary Japanese Studies at the Temple University campus in Tokyo. "Basically," he said, "if you have to spend 16 hours in a stationary train and an additional nine hours getting home, do it in Japan." Two phrases offer some insight into the Japanese psyche. One is "shikata ga nai," which roughly translates as "it can't be helped," and is a common reaction to situations beyond one's control. The other is "gaman," considered a virtue. It means to be patient and persevere in the face of suffering. "It strikes me as a Buddhist attitude," Glenda Roberts, an anthropology professor at Tokyo's Waseda University, said. "Westerners might tend to see it as passivity, but it's not that. It takes a lot of strength to stay calm in the face of terror." 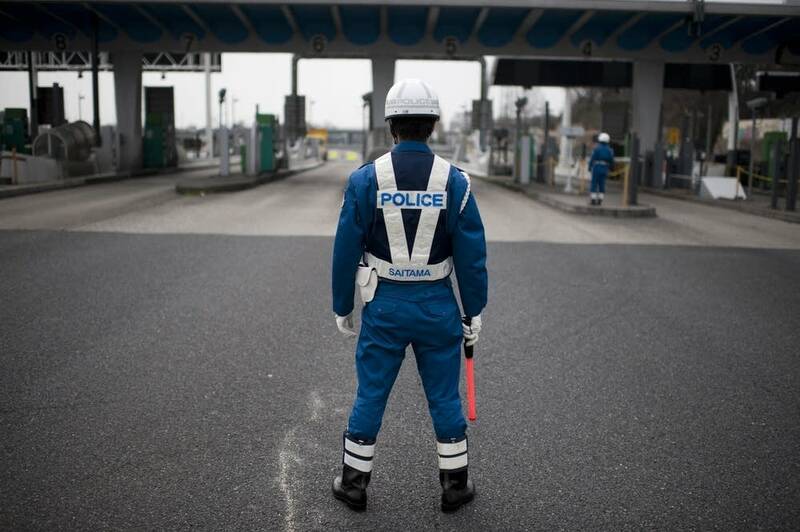 That sense of calm is being sorely tested in Fukushima. Confidence in nuclear officials, in a society built on trust, has been severely tested by explosions at the nuclear reactors and the inability of authorities to bring the situation under control. Japan, as the only country to experience an atomic bomb attack, is particularly sensitive to radiation fears. About 70,000 people have been evacuated from a 12-mile (20-kilometer) radius around the plant. Japan ordered anyone living in a slightly wider -- which is thought to be 140,000 people -- to seal themselves indoors. "We knew it was close by, but they told us over and over again that it was safe, safe, safe, safe," evacuee Fumiko Watanabe, 70, said at shelter at an elementary school in the city of Tamura. "I can't believe them now. Not at all." Others called the evacuation confused and plodding. Authorities told residents not to use their own vehicles, said Koji Watanabe, a 60-year-old taxi driver, but military vehicles focused on children, the elderly and the disabled. He got fed up waiting and decided to leave in his car. He and his wife, who has lung cancer, would like to go farther away because of radiation fears, but they don't have enough fuel. Many gas stations are closed, and those that are open have long lines and often run out. Survivors elsewhere seem at least outwardly calm. The low-lying parts of Ofunato, a city up the coast from Tagajo, are flattened. Crushed cars and boats are jumbled with destroyed trees, utility poles and wooden building frames. Residents are cleaning up the few cleared streets, leaving neatly folded stacks of salvaged clothes on the roadside. "We've got no clothes, no jobs, no home," Junko Niiruma, 63, said. "We don't know what we're going to do." At a refugee center, where children played cards and elderly men read newspapers, some residents said there is frustration, but most people are used to helping each other without being asked. "People are trying to get their lives back together," said Dave Stone, a Los Angeles City Fire Department battalion chief leading a rescue team of 74. "They're picking through their stuff and trying to find pieces of their lives." In Koriyama, an inland city hit by the earthquake but not the tsunami, cheery store clerks served dozens of customers who waited patiently in line in the parking lot of a closed supermarket to purchase limited supplies of toilet paper, tissues and sodas. At a nearby drug store, goods were still strewn on the floor, but shoppers bustled about as if it were a normal day. "There is no panic," store manager Takahiro Shimazu said of his customers. "They line up quietly at the cash registers and everyone is cooperative." Father north, in the seaside city of Hachinohe, Mutsuko Ishino walked her dog Kurumi along the harbor's edge. In her mind, she could still picture the oily black surge of water that carried cars and trees and debris toward her home on a hill above the harbor. Her home escaped unscathed, but the first floor of the salmon factory where she works in the office was destroyed. She and her co-workers planned to start cleaning up Tuesday. "We will make sure this place returns to the way it used to be," the 48-year-old said of her blustery northern city. "Everyone will work together and clean up this mess." Olsen reported from Tamura. Associated Press writers Foster Klug in Ofunato and Tomoko A. Hosaka in Tokyo contributed to this story.